Aspen’s EW-Series (Equipment Series) are equipment/machinery hauling trailers which primarily serve the construction industry. 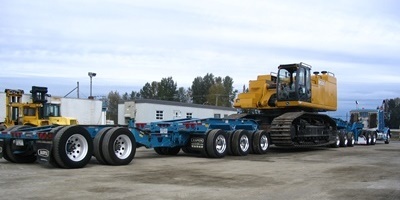 Configurations vary from payloads of 65 tons through 85 ton capacities, with axle configurations ranging from 9 through 13 axles (including truck axles). Aspen EW-Series trailers feature mechanical removable necks with a tower jeep or hydraulic removable necks with double drop, square tail frames. EW-Series trailers can be configured with a variety of components including various deck widths and lengths including custom options. The EW-Series trailers have common air/regulated air suspensions or walking beam (trunnion) suspensions with transporter equalization achieved by a mechanical equalizing inner frame “Cali-Legal” or “West Coast” design. Aspen’s EW-Series of trailers are available in specific regional configurations (Interstate – US and Canada, US North West, and California) to maximize trailer configurations for specific regional regulations. Aspen’s EW-Series was designed from the load down to maximize payload capacity and minimize tare weight. The EW-Series takes advantage of Aspen’s “flex frame” design which allows the frame to flex in all of the right places to allow frame deflection without breaking in key areas of the trailer. Experienced Design … Aspen’s EW-Series is meticulously designed by Aspen engineers with over 240 years of combined trailer engineering knowledge. Not only is engineering knowledge important, but the combination of specific trailer industry experience and mechanical engineering knowledge makes our product one of the best trailer brands in the industry. 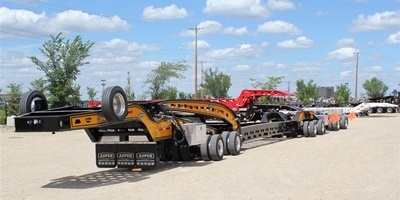 Modular Design to easily and efficiently build the perfect trailer configuration for the majority of your loads … or that special “one of a kind” load that requires some customization of your trailer. Aspen’s California Legal (west coast suspension) ultra-lightweight design with some of the lowest tare weights in the industry provide a platform for high payloads so that you can Haul More. 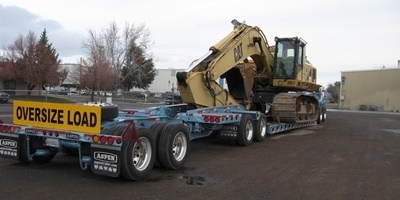 Along with our low profile mechanical gooseneck and a very sturdy flush mounted pin joint, we’re one of the most durable, efficient hauling units to Haul More and put more money in your pocket.